Hall gates of ERET – Tortechnik be performed either with a solid, double, insulated door leaf made of aluminum with double windows, or alternatively as PVC high speed, in addition to an existing Außenanschlusstor. 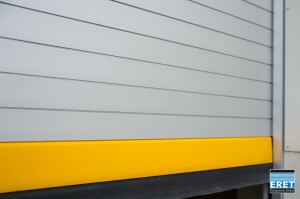 With flexible Schnelllaufotren the already existing conventional industrial door stays in place and the high speed door is mounted compactly on the outside. Alternatively, the PVC door as a combined system behind the Industrial, mounted inside. 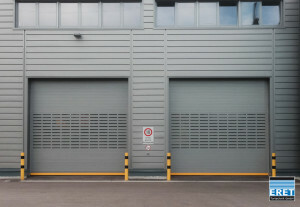 Thus, such a high speed door is the ideal solution for retrofit or in the event of temporary use of a building – the door can be removed and installed the same size on another site. Alternatively, an aluminum high speed take over the tasks of both goals simultaneously. 1. Are both goals simultaneously closed overnight, for example, results in an exceptionally good insulation against accidental opening of the refrigerant loss. 2. If one of the two gates will be damaged by the operation, the other remains fully intact until it is repaired and the building closed. Since the gate systems usually run automatically, the use of surveillance as personal and property protection is recommended. Investing in a room monitoring would pay for itself already in the prevention of a single Anfahrschadens and avoid cost and effort. Speed ​​(Open) 1.2 to 3.0 m / sec. Self-supporting gate construction. Not connected.